2012 has not been the best year to see shooting stars, but that is about to change. The Geminids meteor shower, which is already producing some shooting stars in the Hawaiian skies, keeps picking up steam and will be most active during the early morning of Dec. 12 and Dec. 13. However, you will be able to see Geminids through Dec. 17. The nights of Dec. 12 and Dec. 13 will be extra good for stargazing because the moon is absent, and the sky will be very dark. The peak activity of the Geminids meteor shower in Hawaii will be during daytime Dec. 13, but you can still expect to see more than one shooting star / minute the night before and after. The Geminids are named after the constellation “Gemini.” This is because every shooting stars appear to ‘radiate’ away from this constellation. In December, Gemini rises around 8 p.m. in the east, is directly overhead around 2 a.m., and moves toward the western horizon at sunrise. 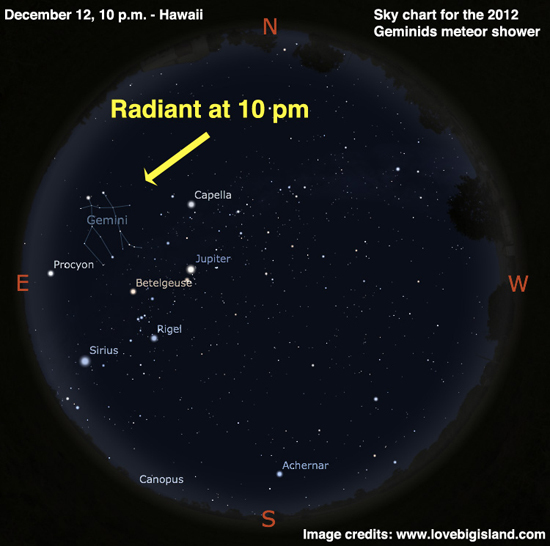 The Geminids are one of the most reliable and spectacular meteor showers of 2012, and viewing conditions are near perfect for Hawaii. After the somewhat disappointing 2011 Geminids meteor shower, 2012 is a great year to see the Geminids shooting stars from Hawaii (and all around the world). If you plan to watch only one meteor shower in 2012, make it the Geminids. The new moon (Dec. 12 at 10:42 p.m. Hawaiian time) means that the night sky is very dark, and the very broad peak (about one day) of the Geminids happens for Hawaii during the daylight hours of Dec. 13. This makes the hours between midnight and early dawn on the night of Dec. 12-13 the best time to watch the 2012 Geminids from Hawaii. During these nights under perfect viewing conditions you should be able to see 100+ shooting stars / hour. You can also see this meteor shower a few nights before and after Dec. 13, but don’t expect to see as much as during the peak. Best viewing time is between 2 a.m. and 3 a.m.
Jupiter and Orion are both close to the Geminids. Orion is easily recognized by its ‘belt’, the three stars that are aligned. On one side of Orion’s belt you can find Jupiter, one of the brightest points on the sky. On the other side of Orion’s belt you can find Sirius, the brightest star in the sky. Draw a line through Jupiter, Sirius and Orion’s belt, and look for a reddish star close to Orion. This is Betelgeuze, a red supergiant. You can find the radiant of the geminids, and most shooting stars, on this side of the line.